The Stratford Library will kick-off Stratford’s annual Christmas tree lighting ceremony with a holiday program for families, “The Small World Magic Show” with Magician Debbie O’Carroll at 4:30 p.m. Nov. 27.The show will precede the town event, which this year is being held on the steps of Town Hall, according to a release. The family program is free and open to the public.More about the show: "Magician Debbie O'Carroll's magic hat is on the fritz! Where in the world can she find a new one? Will she choose a wizard's hat from England, a sorcerer's turban from India, a conjurer's cap from China, a genie's fez from Turkey, a fairy godmother's crown from France, a seanachie's tam from Ireland or a sprite's headdress from Ghana?" 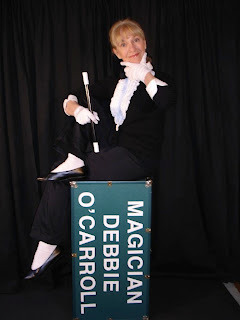 To learn the answer: join O'Carroll "on her magical quest around the globe." "Full of physical comedy and audience participation, “The Small World Magic Show” is ideal for all ages." O’Carroll has performed at schools, libraries and festivals across the country, the release said. She also teaches theater, magic and dance workshops at many elementary and high schools in Massachusetts, the release said. In the event of inclement weather, the program and tree lighting will be held on Nov. 28. Due to safety concerns, parents with strollers will be asked to “park” their stroller in a designated area in the Library’s main lobby. Families are invited to attend public caroling and the tree lighting ceremony following the magic show at Town Hall. For more information, call the Stratford Library Children’s Department at 203.385.4165 or visit: www.stratfordlibrary.org. Editor's note: All information in this post was contributed.